Click on UNDERLINED text, or on one of the buttons on the sidebar, for more information. Areas that are yellow green, on the map, are historical settlements that no longer exist. Bolded items are current communities. AVERY TOWNSHIP was organized in 1873. BRADGATE Located at the conjunction of Sections 5, 6, 7 and 8 of Avery Township. # Park Grove - post office from October 1872 to October 1877, formerly Humboldt, not the current Humboldt, but one as a post office from October 1865 to October 1872 -- located in Avery Township, Section 7. # Pleasant View - post office from April 1879 to November 1882 -- located in Avery Township, Section 14. BEAVER TOWNSHIP was organized as Dakotah Township in August, 1857. 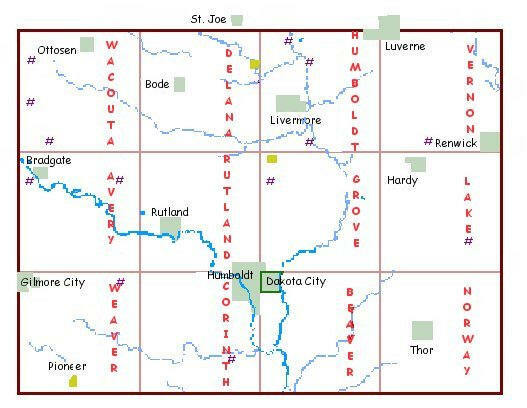 In 1878 Beaver Township was organized, "leaving Dakota to be comprised alone of the town of that name. DAKOTA CITY Located in Section 6 of Beaver Township. It is the smallest County Seat in all of Iowa. CORINTH TOWNSHIP - was organized in 1876, "this cut down the township of Springvale to the small limits of the town, so that they are at present , co-extensive." HUMBOLDT The city is the largest in Humboldt County. It was originally named Springvale. It is located in Sections 1, 2, 11, 12 and 13, of Corinth Township, and in Section 35 and 36 of Rutland Township. # Addison - post office from August 1866 to January 1904 -- located in Corinth Township, Section 26. DELANA TOWNSHIP was organized in 1870. # Lott's Creek - early post office located in Delana Township, Section 13. It is shown on maps of 1857 as Lotts Creek. # McKnight - post office from June 1883 to February 1887, formerly McKnight's Point -- Wacousta Township, Section 7. # Nora - post office from January 1875 to March 1882 -- located in Delana Township, Section 19. GROVE TOWNSHIP was organized in 1873. Presently there are no towns in the township and it is likely there will be none in the future. # Arnold - post office from August 1900 to November 1929. It was previously known as Grove- located in Grove Township, Section 6. # Randolph - post office from December 1874 to December 1875 -- located in Grove Township, Section 7. LIVERMORE Located in Sections 17 and 18 of Humboldt Township. LUVERNE Located in Section Section 1 of Humboldt Township and Section 6 of Vernon Township. Additionally, in Kossuth County. # Byron - post office from June 1871 to October 1881 - located Humboldt Township, Section 5. # Eber - post office from February 1858 to November 1862 -- located in Humboldt Township. # Von - post office from February 1871 to January 1882 -- located in Humboldt, Section 34. LAKE TOWNSHIP was organized in 1870. HARDY Located Section 4 and 5 of Lake Township. # Owlake - post office from March 1899 to June 1903 -- located in Lake Township, Section 26. NORWAY TOWNSHIP was organized in 1875. THOR Located at the conjunction of Sections 16, 17, 20 and 21. # Verbeck - post office from June 1880 to January 1882 and then the name was changed to Thor. RUTLAND TOWNSHIP was organized in 1867, along with Springvale Township. This was a decision of the Board of Supervisors. VERNON TOWNSHIP was organized in April, 1865. RENWICK Located in Section 36 of Vernon Township. # Viona - post office from May 1868 to June 1882 -located in Vernon Township, Section 34. WACOUSTA TOWNSHIP was organized in August of 1857. OTTOSEN Located in Section 5 of Wacousta Township. # Wacousta - post office from March 1863 to October 1883 -- located in Wacousta Township, Section 32. GILMORE CITY Located in Section 6 of Weaver Township and in Pocahontas County. PIONEER has been unincorporated. It is located in Section 33 and has a population of 26 persons. "Iowa Post Offices: 1833 -1986" by Alan H. Patera and John S. Gallagher "Postmarked Iowa" by Guy Red Ramsey. "The History of Kossuth and Humboldt Counties"